Mathematics is a creative and highly inter-connected discipline that has been developed over centuries, providing the solution to some of history’s most intriguing problems. It is essential to everyday life, critical to science, technology and engineering, and necessary for financial literacy and most forms of employment. It is therefore vital that all students learn exactly how Mathematics relates to and underpins other curriculum subjects and that they develop the skills that are necessary to help achieve success in further education, employment and adult life. At Prenton we place an early emphasis on developing strong numeracy skills which underpin the entire Mathematics curriculum and support students’ learning in other areas such as Science, Design Technology, Computing and Geography. The Mathematics curriculum also encourages students to make connections across mathematical ideas to develop fluency, mathematical reasoning and competence in solving increasingly sophisticated problems. All students are taught in ability groups throughout Years 7 and 8. This allows students of similar ability to be taught together allowing for maximum progression. Groups are based upon students’ Key Stage 2 scores on entry to school, but in addition we also look at the results from baseline tests completed in the first two weeks of year 7. Movement between groups, however, does occur throughout years 7 and 8. From the outset, students are given aspirational targets and regular assessment allows us to monitor the progress made towards targets. In addition, we have a programme of intervention and support for those students who struggle mathematically such as 1:1 tuition and our Buddy system, as well as accelerated learning for our academically able. Each year our Year 7 and 8 students compete in Enterprise Days, a cross-curricular event organised jointly by the Maths and Design Technology departments. These event test students’ entrepreneurial flair, testing their maths skills to ensure that they return a profit on their ventures. Assessment: Assessment comprises three written examinations taken at the end of a 3 year course; two calculator papers and one non-calculator paper. All examinations are taken at the end of Year 11. Each paper contributes 33.33% of the qualification and lasts 1 hour 30 minutes. Each paper contains 80 marks and will have a range of question types; some questions will be set in both mathematical and non-mathematical contexts. The qualification will be graded and certificated on a nine-grade scale from 9 to 1 using the total mark across all three papers where 9 is the highest grade. Individual papers are not graded. At Higher Level grades 9-4 are available, whilst at Foundation level grades 5-1 are available. All 7 classrooms in the Maths department are equipped with interactive whiteboards. Students access to the online programs My Maths, Mathswatch and Mathletics so that they can continue their learning outside the classroom. UKMT club (by invitation only). Students can be seen here taking the UKMT challenge and with their certificates. Numerous opportunities! 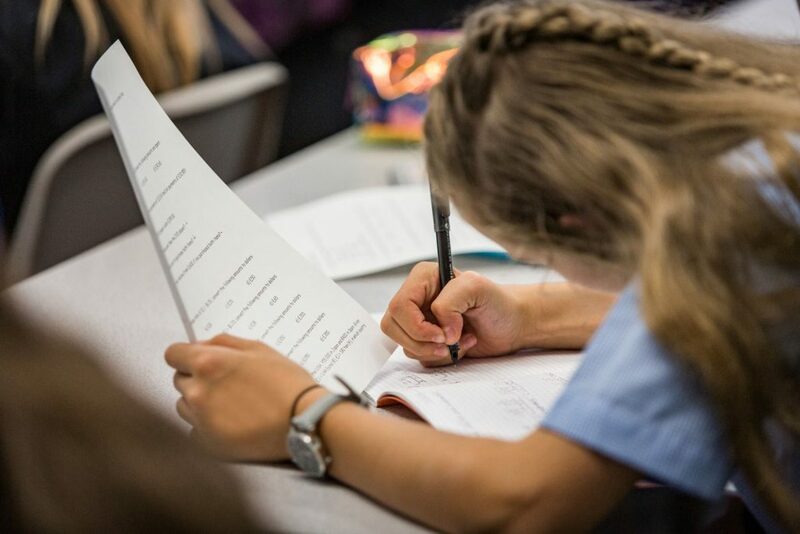 GCSE mathematics is a prerequisite for further education and can lead to careers in many different areas such as engineering, accountancy, medicine, architecture and statistics to name but a few.